Bryant - Wild’s Plumbing, Heating and Air Conditioning, Inc. Bryant - Wild’s Plumbing, Heating and Air Conditioning, Inc.
Wild’s Plumbing, Heating and Air Conditioning, Inc. are pleased to be a certified dealer of Bryant ® Heating & Cooling Systems because we believe in offering high quality products that will keep your home comfortable for years to come. 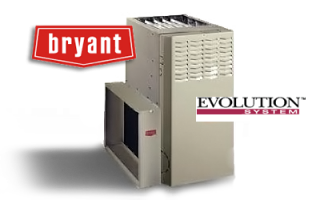 Bryant ® furnaces and air conditioners will save your household energy which in turn will save you money. There are various systems to choose from that will be more beneficial than keeping your current heating or cooling system. That’s why we suggest consulting with one of our professionals to ensure you purchase the best unit for your home. Plus, our technicians have a keen sense for recommending specific units for the size of home or office you want climate control in. Please follow the link to the official Bryant ® Heating & Cooling Systems website for more details about energy and cost savings for your home.